Jimmy Red Grits for sale. Buy online at Zingerman's Mail Order. Gourmet Gifts. Food Gifts. Jimmy Red is an heirloom varietal of corn. 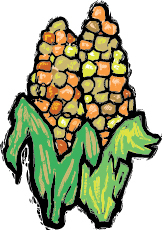 The name comes from James Island, South Carolina, where it was first grown, and from the deep red color of the kernels. Though growing Jimmy Red corn is more labor intensive than most corn on the market these days, the flavor is amplified about a hundred fold. The grits are ground by Anson Mills using stone mills, which keep all of that flavor intact. The first time I tried them was in a tasting of several of Anson Mills' heirloom grits. Even among the best of the best, Jimmy Red stood out. These are some of the best grits I’ve ever tasted, with robust, mildly sweet, long-lasting flavor.